We are engaged in offering comprehensive range of pole erection that is known for its durability and robust construction. These are manufactured using advanced technology and are available at affordable price. Such machines takes less time and saves huge cost and also enables us to timely execute the work. - Frame V Gas Turbine and Generator 02 Units at HPCL, Vishakhapatnam, AP., India for BHEL. Piping, Bypass System and Balance of Plant for at Kuttalam, TamilNadu, India for BHEL. - Machine takes very little time to make a pit (Approx 05 Min) against the time taken by manual labour is 5 to 6 hours. This reduces the burden of labour management and huge cost saving. - The complete cycle of pole erection can be done by two labours only against the current manual practice of 12 to 14 labours. 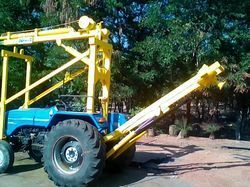 We are actively engaged in bringing forth the clients an excellent assortment of Pole Erecting Machine. 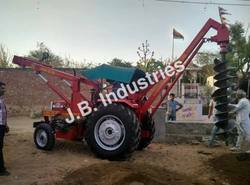 Being one of the leading manufacturers and suppliers of this Tractor Erection Machine we never compromise with its quality.